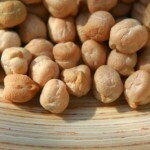 Most people look at garbanzo beans (aka chick peas) and think hummus. Jessica Seinfeld sees them and thinks chocolate chip cookies while Words to Sweat by-sponsored fencer Mariel Zagunis thinks chickpeas with chard and pan-roasted tomatoes. Steamy Kitchen, however, thinks straighforward and simple snack in her crispy roasted garbanzo beans. Thanks @oldhat for tweeting this recipe.